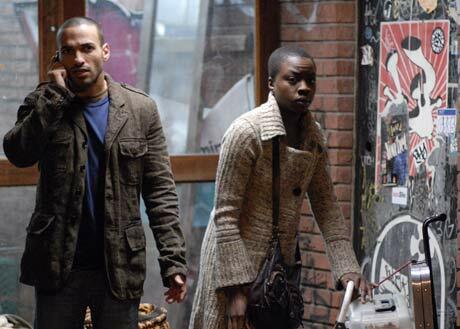 CAPTION: Haaz Sleiman and Danai Gurira call their agents demanding better scripts. Thomas McCarthy’s second feature film had the potential to be a poignant human drama, but instead sacrifices the story for the message. The Visitor unfortunately turns out to be one of those political message films that, for me, is impossible to review or talk about without giving away the ending and discussing the message. A meek economics professor (a likable but uninteresting Richard Jenkins) goes to New York City for a conference only to find an illegal immigrant couple has been living in his apartment for two months. The premise is weak and was unbelievable as I didn’t feel any one of the three would’ve reacted the way they did in this situation. They all just seemed too nice and polite, completely unlike real people. However, I was willing to forgive the premise if the film were to turn into a believable character study like writer/director Thomas McCarthy’s previous film, The Station Agent. Sadly, The Visitor offers no such insight into human relationships. There were some mildly amusing moments where the character Tarak (Haaz Sleiman) teaches the professor to play the African drums and Zanaib (the beautiful and quietly emotive Danai Gurira) walks in on the professor practicing alone. However, these moments didn’t add up to anything as the film slowly devolved into a preachy political film where we witnessed Tarak arrested erroneously for jumping a subway turnstile, detained, the professor hired a lawyer to help him, his mother (Hiam Abbass) came to the city to his aid (and formed an unlikely friendship with the professor), and director McCarthy, in not so subtle ways, delivered his message. The major problem with the film is the weak screenplay that doesn’t give us the details behind why Tarak, his family, or his girlfriend had to enter the country illegally. We’re given stereotypical reasons why they wanted to leave their homelands (i.e. political strife, denial of civil rights, family members dying), but no background on how they got to the U.S. and why they stayed here illegally. McCarthy depicts the agencies handling immigration, detention, and deportation as a monolithic cold-hearted corporation that doesn’t take into account the human element. I don’t doubt there is much truth in this generalization, however, McCarthy gives us no solution on how to reform that or point to any specific law that could be changed to prevent nice people like Tarak from getting deported. Strangely, the only argument he presents is that Tarak was a nice guy. The bottom line is, Tarak was here illegally, he was essentially without a job, homeless, and his mother (unbeknownst to him) deliberately circumvented the proper legal channels. In the end, the lawyer trying to defend him had no recourse. I surely sympathized with the characters on the superficial level where McCarthy presented them, but I didn’t totally disagree with the end result of Tarak being deported (though the means to that deportation seemed cold and tactless). Though the pace seems static and the dialog stilted much of the time, McCarthy peppers the film with a nice multi-ethnic New York feel, and for the most part, the performances are solid. However, by presenting us with an overly simplistic “nice people shouldn’t be deported” message, he unfairly leaves the audience to sit along with Richard Jenkins while he takes out his frustrations on his drum in the subway. I would’ve liked to have known the characters a little more, then maybe the message would’ve carried some more weight, and we wouldn’t feel so apathetic. This entry was posted in Art-house Cinema, Current Events, Movie Reviews, Movies, Politics and tagged Danai Gurira, Deportation, Detention Centers, Haaz Sleiman, Hiam Abbass, Illegal Immigration, New York City, Richard Jenkins, The Visitor, Thomas McCarthy.